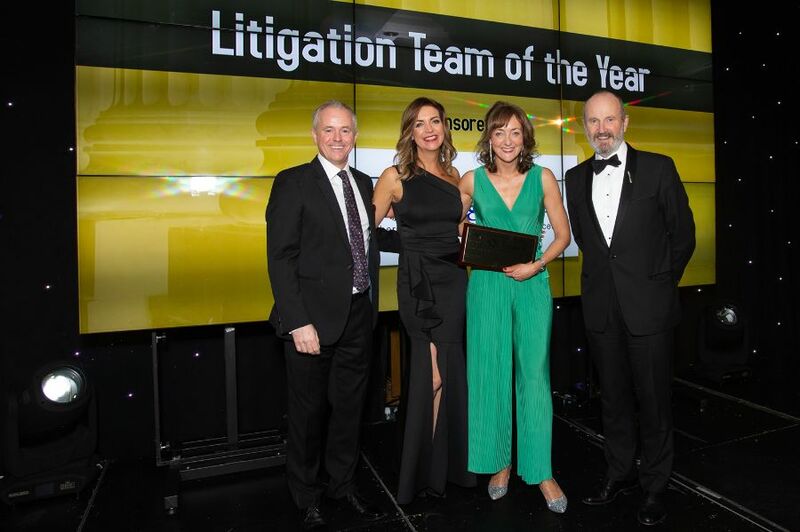 Allan McDougall Solicitors’ personal injury team won the Litigation Team of the Year category in the Law Awards of Scotland 2018 at a glittering ceremony in the Hilton Hotel, Glasgow, last night. Organised by The Herald, the Law Awards of Scotland are recognised as the Oscars for the Scottish legal profession. The Litigation Team of the Year award was sponsored by Stirling Park. Julie Harris, partner and head of personal injury at Allan McDougall Solicitors, said: “Winning this prestigious award is a tremendous boost for our team. We have a fantastic team of lawyers, paralegals, PAs and support staff who work very hard in our clients’ best interests every day. Congratulations to all of them on this excellent achievement! We would also like to thank all our clients across Scotland, both for choosing us to represent them and also for giving such consistently excellent feedback on all our team members. Special thanks go to Unite, the UK's largest trade union, for whom we are Scottish panel solicitors. In addition, many other law firms around the country refer their personal injury cases to us via our Injury Compensation Alliance, and we are very grateful to them for choosing to work with us. Allan McDougall Solicitors also picked up the award for High Street Firm of the Year at the awards in conjunction with our sister brand McDougall McQueen.